Energy use projections from the 2013 International Energy Outlook are used to derive additional data quantities related to the buildings sector worldwide. The U.S. Energy Information Administration (EIA, eia.gov) publishes an International Energy Outlook (Reference 1), with detailed sectoral energy use data biennially (and limited data every other year). Total world energy consumption by end-use sector, with projections to the year 2040, are published for delivered energy in units of quadrillion Btu/yr (quad). Delivered total energy consumption (sometimes also called “total final”) is useful for understanding many aspects of sectoral energy use, but total primary energy consumption (with electricity losses) is also important to understand. The EIA reference case projected annual energy use sectoral breakouts were used to develop the energy use estimates shown in the table below for selected years, for both delivered energy and primary energy. Primary energy must be derived from the EIA data. The other change made is that energy units are converted to exaJoule from quad for the tables presented in the body of this paper. Figure 1 shows these end-use sectoral primary energy annual consumptions for the same three years to provide a sectoral comparison. Next the total primary energy by major region of the world is presented in the table below, where primary energy must be derived from the EIA data and converted to EJ. Some detail on the regions is provided in the table below. OECD Europe is not the same as the Eurozone and has 25 countries as of 2014 (see for example, http://stats.oecd.org/glossary/detail.asp?ID=1884). For statistical reasons, the EIA includes Israel in OECD Europe. Major world regions are shown in bold, with sub-regions of the major regions underneath but not bold. Data for sub-regions sum to the major region totals, but not necessarily exact due to rounding. The two major analytical categories are OECD and non-OECD countries, and those categories are shown in bold also. As can be seen from these data, non-OECD countries are evaluated to already account for over 54% of world primary energy consumption in the year 2010, increasing to 65% in 2040. The buildings sector is usually considered as the combined residential and commercial sectors, and the results presented here will be for the combined results from the EIA data for these two sectors. 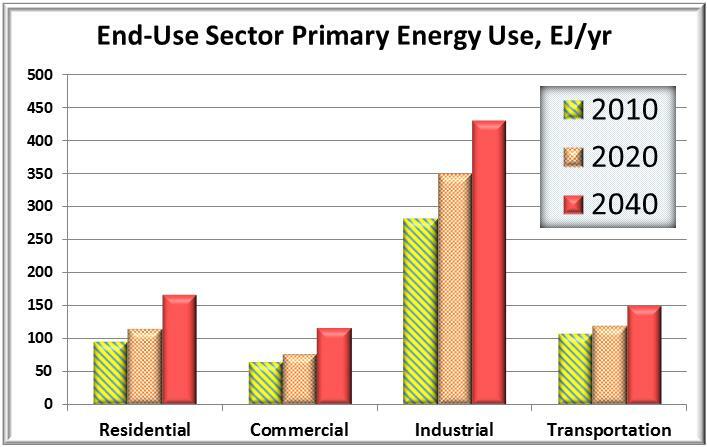 The table below indicates the buildings sector percentage of total worldwide energy use for both delivered and primary energy, based on the EIA reference case data. On a primary energy basis, the buildings sector worldwide is about one-third of total energy use, with some growth relative to the other sectors expected by the year 2040. The percentage of delivered energy remains about one-fifth of total world energy use until expected growth starts to increase toward one-fourth by 2040. On a regional basis, these percentages vary a lot, so the regional percentage values will be presented in the next table for primary energy. The percentages indicate an upper limit of 40–45% for the next few decades, with the United States having zero growth in the percentage over several decades. The highest growth in percentage is in non-OECD Asia and Central and South America (both OECD and non-OECD). India is expected to have the highest growth in percentage worldwide, while the Middle East is expected to have negative growth in the percentage. Growth in energy use and percentage growth for the buildings sector in OECD Europe appear at odds with policy directives, so the trends there will bear watching. Since the percentages for OECD Europe are lower than the United States, Canada, and Japan, possibly the buildings sector there has some lower equipment saturations that will increase over this time period. Non-OECD Europe is not expected to see the growth in building sector primary energy use percentage that OECD Europe is expected to have (0.3% annual growth over 30 years vs 0.6%). 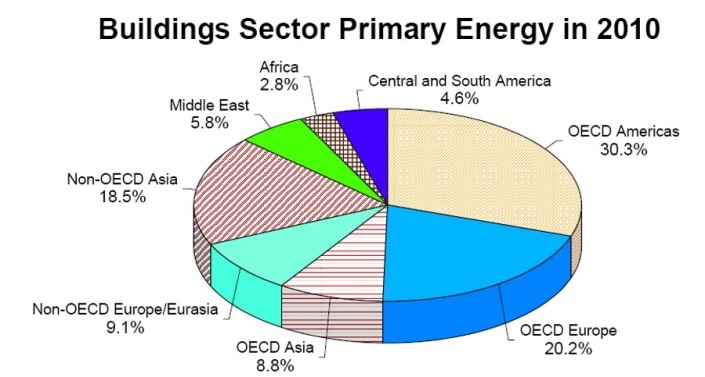 Figure 2 shows the world total for building sector delivered and primary energy for these selected years. 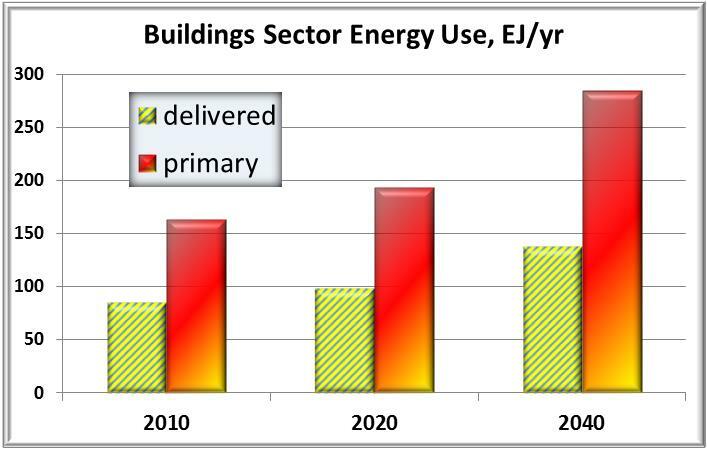 Buildings sector worldwide primary energy use is projected to almost double between 2010 and 2040. Increasing electrification also leads to larger increases in primary energy than for delivered energy use. The regional breakouts for this energy use will be presented in the following tables, with delivered energy first, followed by primary energy. Buildings sector energy use in non-OECD countries remains less than the total for OECD countries in the year 2020, but is expected to exceed OECD building sector energy use by the year 2040, driven primarily by growth in non-OECD Asia. 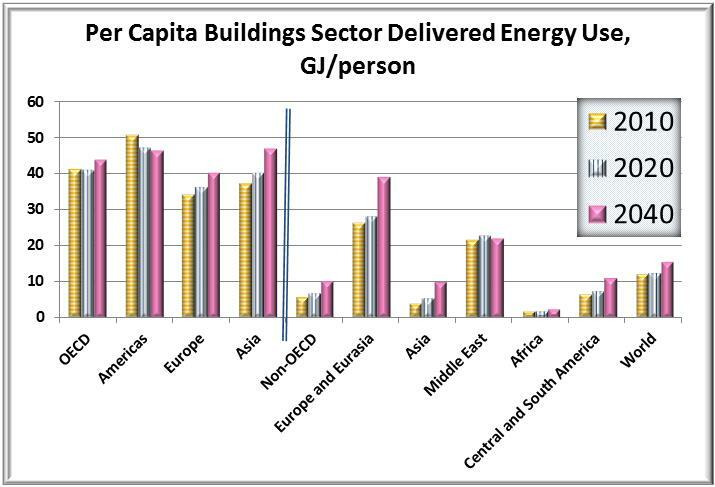 Growth in buildings sector energy use is highest in India and China, and lowest in the United States and Japan. Also note that building sector primary energy worldwide is expected to be more than double delivered energy in the year 2040. 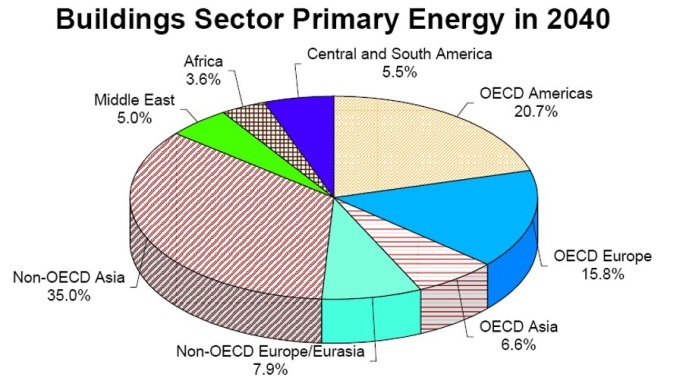 Figure 3 shows the percentage of worldwide primary energy for the buildings sector by major region for the year 2010 on the left side and 2040 on the right. The increasing dominance of non-OECD Asia is evident. While together the OECD Americas and OECD Europe regions account for about 50% of worldwide buildings sector primary energy use in the year 2010, these two regions only account for about 35% in 2040. Finally, building sector energy normalized by estimated population will be presented. Residential sector energy use is typically normalized for population, but the position taken here is that both the commercial sector and the entire building sector should also be normalized by population. Population growth relative to commercial sector growth, levels of visa workers, as well as other factors, can cause some distortions for the commercial sector at the regional level used thus far, but major issues with other normalization approaches exist. Commercial sector energy is often “normalized” or “indexed” to the gross domestic product (GDP) account of countries, and some type of “constant” monetary value is needed to do such normalizations over time. So-called “constant” or “chained” monetary values are supposed to adjust for inflation or deflation to maintain some type of reasonably “constant” value of money so that the GDP is comparable over time. Excessive tinkering with how the “constant” money values are calculated has led to a situation now where official published data on such money values have low credibility. In addition, the recent development of highly unfettered financial derivatives markets calls into question how much manipulation of financial markets can be ignored in attempting to use money values for normalization of any market quantity, including energy. The decision here is that using population provides more meaningful information than using GDP. Another common factor used to normalize commercial sector energy use is floor area, but the levels of uncertainty in measuring and defining the floor area values to be used are large compared to uncertainties in population. Uncertainties with residential floor area values to be used are also large and problematic. Per capita delivered energy for the major world regions (no sub-regions) is presented in the next table. The population data are derived from the IEO 2013 (Ref 1) by dividing residential sector energy use by energy use per capita as presented in that report. Although there may be issues with these values, they should be close enough to consider the trends and comparisons possible. The population data are included in the data annex for this paper. Also, possibly the per capita primary energy use may provide additional information, but given the preliminary nature of exploring such data, an additional table on per capita primary energy will not be presented here. Figure 4 displays the same data graphically for comparison, with OECD data on the left and non-OECD data on the right. The data indicate that overall buildings sector delivered energy use of 40–50 GJ/person may be a likely upper limit for more developed economies, and possibly energy targets could be set for national or regional building sectors based on a reference benchmark of 40 GJ/person. Buildings sector energy performance possibly could be defined as “high energy use per capita” for values over 40, and other denominational values for lower energy use per capita. Details for any such performance rating system will be left for others to consider. One thought though is that, with an average for the world expected to be 12.9 GJ/person by the year 2020, performance of higher-energy-using states could be based on progress toward the world average over time. British thermal unit (Btu) — Generically, the amount of energy or heat required to raise the temperature of 1 lb of water (about ½ quart or ½ liter) 1 degree Fahrenheit (equals about 1,055 Joules). Joule — Watt-second, the energy to maintain 1W for 1sec. The data annex for this paper is presented next and includes the extended regional data used to calculate the buildings sector energy use percentages and primary energy by major region. EIA presents many of the data quantities, including the delivered energy, directly, and those data are reproduced in the table. Buildings sector percentages are for primary energy. Regional population data used for the per-capita derivations are also included. Note that the energy units from the IEO 2013 report are retained as quadrillion Btu, and not converted to EJ.